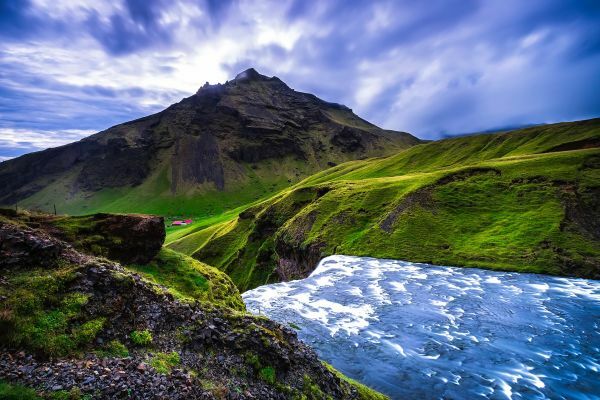 Iceland, which boasts of Norsemen and Vikings, now inhabited by their fiery descendents is the lovechild of the Northern Hemisphere. Experience the confluence of the concrete marvels of modern civilization, the color of independent youth and the raw and harsh, icy expanse of natural wonders spread across a rugged terrain of volcanic landscapes; a picture as rare as true love!If you are a traveler whose choice of substance is exploration and the love for fantastic landscapes, then a trip to Iceland should be considered as necessary as the human necessity to drink water for survival. Reykjavik– the capital of Iceland, also the northernmost capital of the world is a mosaic picture of the old and new. Being the most populated and developed city of Iceland, Reykjavik is quite naturally the cultural hotspot. The copulation of the rich history and folklore with the new age thought of the young vibrant population makes Reykjavik far from the reach of convention. From the national park, Þingvellir, where one experiences geology in action as tectonic plates break apart from each other to experiencing the chrome dance of nature as The Northern Lights paint the open sky canvas, Iceland is a treat to those willing to love life. Thingvellir , meaning ‘Parliament Plains’, where the Mid-Atlantic Ridge can be seen on dry land before disappearing into the ocean floor, where one could place one foot on the North American tectonic plate and one foot on the Eurasian one; Geysir , that claims its fame as the first natural spouting spring known to Europeans and Gullfoss, known as the ‘Golden Waterfall’ due to the way it cascades into a deep gorge with tremendous force, together form a trinity famously known as the Golden Circle among travelers. For those interested in fantastic folklore and want to hear about the Iceland also boasts of the legend of elves and huldufólk (hidden people) that are said to exist in the Reykjavík suburb of Hafnarfjörður. Travel to Iceland, an alloy of many worlds- old, new and ones in becoming, combine to form an otherworldly image; where the craftsman’s hands have created concrete structures of magnificence to pay homage to the creation of the super-craftsman’s marvel of paradise landscape; where fantasies are realized. If you are a traveler whose choice of substance is exploration and the love for fantastic landscapes, then you should plan a trip to Iceland.